Provasil is a natural supplement substance, and the manufacturers state that it can improve your cognitive functions. What sets this product apart from typical supplements is that it utilizes a 100% natural formula. It concentrates the benefits of many extracts and brain foods that have been proven to benefit the mind in some way or another into a pill. There is no prescription required for Provasil as it is not a dangerous pharmaceutical. Provasil may be a product of interest to you if you have been having problems with your memory. One of the most crucial functions of this supplement is that it purportedly helps to improve memory. You may also be interested in Provasil if you have trouble focusing. It may be a helpful and safe alternative to prescription study aids and focus enhancers. The official Provasil website states that the formula used to make it is 100% patented and natural. The proprietary blend includes a mixture of substances that are produced naturally in the human body as well as herbal extracts. N-acetyl-L-carnitine – N-acetyl-L-carnitine is a kind of amino acid that is naturally found in certain meats. By increasing acetylcholine (a neurotransmitter that has been observed to help fight Alzheimer’s) this amino acid improves memory. Phosphatidylcholine – Phosphatidylcholine is needed to produce acetylcholine which, again, is important for fighting memory loss. Resveratrol – Resveratrol is a kind of antioxidant and some studies on it suggest that it may slightly improve conditions like dementia and Alzheimer’s. Panax Ginseng – This type of ginseng is very high in antioxidants which may protect the brain as it ages. Can Provasil enhance your brain’s performance? It may seem hard to believe that taking a single pill can improve the way your brain functions, but that is the belief of many people who use Provasil daily. There is a science that supports the claim that natural ingredients can actually have a beneficial impact on the workings of the mind so it is not an outright far-fetched idea. Whether or not it will work the way it is intended to on a given individual remains to be seen, however. There are some good reviews on this product, so it works to improve cognitive function for some people. Some users of Provasil have claimed that it helps improve memory and memory falls under the category of brain performance. So it would seem that at least in some instances Provasil really can improve brain function. Still, the consumer should be aware that these effects may not be typical for everyone and they are certainly not guaranteed. What are the pros of Provasil? In order to help the customer make a sound decision, we have compiled a list of Provasil benefits. Provasil may be able to improve your memory and preserve it as the brain ages. Provasil contains the right amount of antioxidants which can be beneficial to the brain and body in some ways. Provasil features a natural formula that is devoid of stimulants and substances that can become addictive. What are the cons of Provasil? The fact that some of the ingredients in Provasil have been shown to have effect only when taken in very high doses. We are not told whether this product is safe to consume for vegans. Some of the components of Provasil have been known to cause mild side-effects for people with certain health issues. There have been no reports of Provasil resulting in dangerous health problems. It is a natural formula that has been clinically studied so for most people Provasil will be safe to use. How should you use Provasil? The recommended usage, which should not be diverted from unless a doctor has approved, is to take 1-2 Provasil tablets each day with your morning meal. For one bottle of Provasil the price is $44.96. You can also buy Provasil in a bundle of three bottles which comes to $119.96. If you buy five bottles, the total will be $187.32. The company that makes Provasil is called Cognetix Labs, and they claim that their product is one of the best brain enhancement supplements on the market. In addition to enhanced memory, the company claims that it will help the user focus more easily and intently. We are also told that the formula used to make Provasil is all natural and is therefore non-addictive. You can find Provasil on the official Provasil website where you have the opportunity to buy straight from the manufacturer and take advantage of the 60-day money back guarantee. Provasil can also be purchased at many online retail sites. 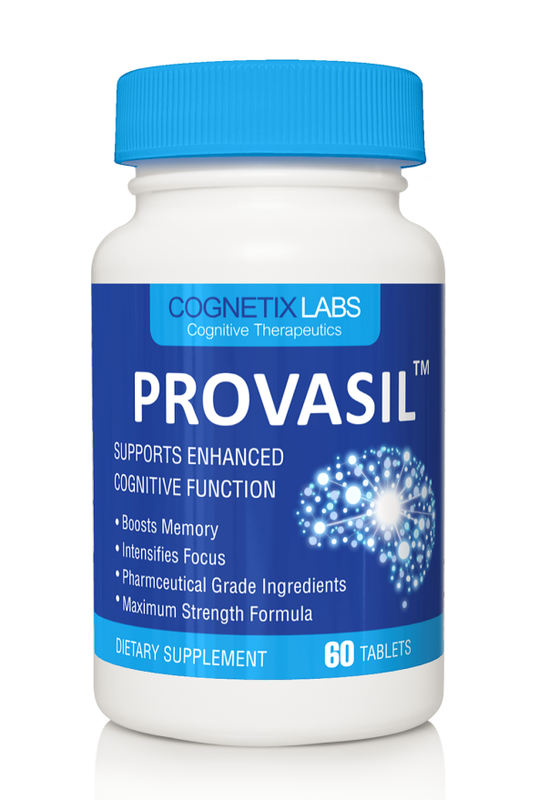 While Provasil does offer some intriguing potential benefits like improved memory, focus, mental energy and protection for the brain against the ravages of age, there is no telling how well it can work for each. What works for one person may not work for another. The best way to approach Provasil is to first consult with a doctor or neurologist if at all possible. If you can’t talk to a doctor or specialist, then try reading a Provasil review or two, in addition to this one. Other people’s insight into the product may better inform your decision and help you make the right call.